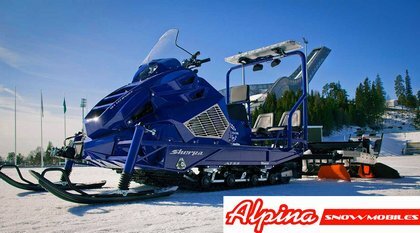 At Interalpin 2011, Hall 2 EG–Stand 54, Alpina will officially unveil its new dual-track snowmobile “Sherpa” 1.6L Ti-VCT. The aggressive and sharp design makes the new Sherpa look very sporty and massive, in countertendency with the smooth and rounded shapes of the previous Sherpa 1.4. But the name it’s the same, recalling the strenght and power talents of the former Sherpa lauched in 2002. The new 1.6L Ti–VCT inherits the layout and the dimensions of the predecessor version: dual track 500 + 500 x 3968 mm , mig-welded hybrid steel chassis with a wide cargo platform, twin steering ski. The machine is however much different and the performances are substantially improved, with an average operating speed double than the 1.4 version. 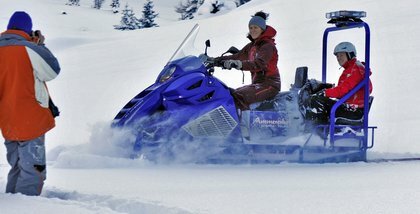 The new engine is really the most advanced powertrain ever installed on a snowmobile. With its 1.6L displacement and 115 hp in a compact light block, it has a proven technology derived from the automotive segment. Since 2002, Alpina has been the only manufacturer using the state-of-art technology available to minimize the exhaust emissions, like the catalyst with twin oxygen sensor. 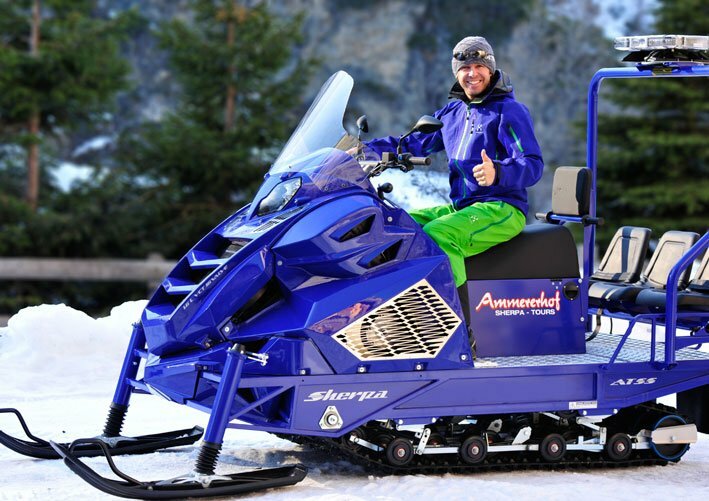 The new Sherpa engine is automotive Euro-5 and EPA compliant, with emission levels a great length lower than the ones achieved by any other snow-vehicle. There is also an electric engine block pre-heater, that shortens your warm-up time and reduces pollution. The 4 cylinders with 16-valve and VCT system (Variable Camshafts Timing) delivers a smooth power and plenty of torque at every engine speed. The engine is managed by a reliable computer with diagnostic connection standard CAN/OBD-II. The cooling system is extremely efficient even in the warmest weather conditions, thanks to its wide front radiator, the aerodynamic intakes and the dual electric fan with dual speed. With the new CVT transmission and the gearbox with Hi/Low ranges, the Sherpa is the most versatile vehicle for working on the snow: it can manage the very low speed needed for the ski tracks setting, and it can easily reach 80 km/h when speed and agility is required. The brakes are reliable and powerful as usual on Alpina machines. On the “deck”, the new driver’s position is comfortable for any size from S to XXXXL, with a soft heated saddle and more room for your knees. All the controls are easy to reach on the hand-bar with heated grips, and the extra-large instrument cluster is a fancy interface between the machine and the driver, with TCMS (Torque Converter Monitoring System) like on the former Sherpa models and the anti-theft / immobilizer system is standard. The new “diamond-design” of the fiberglass panels is made to provide a perfect engine cooling and a perfect driver heating. The tall windshield and the aerodynamics create a warm-air cushion around the driver, protecting him from the snow and the wind-chill. Steering is easy, and the legendary Sherpa stability will not require you to change position on the foot-rests in order to keep straight the machine. With the new Sherpa, the head-lights power is doubled, and the 4 halogen lamps deliver a 240W bright beam, turning your night into full day. 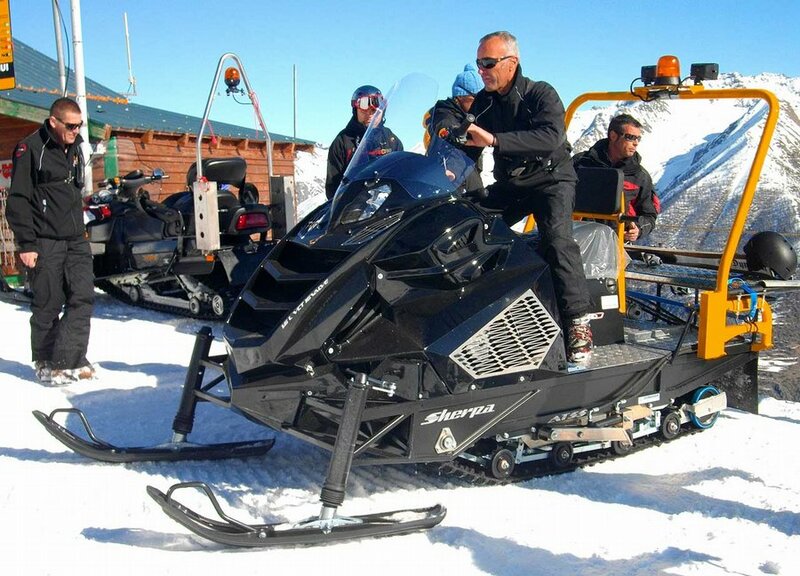 Functionality means also a wider range of additional equipments specially designed for the Sherpa and for your work. 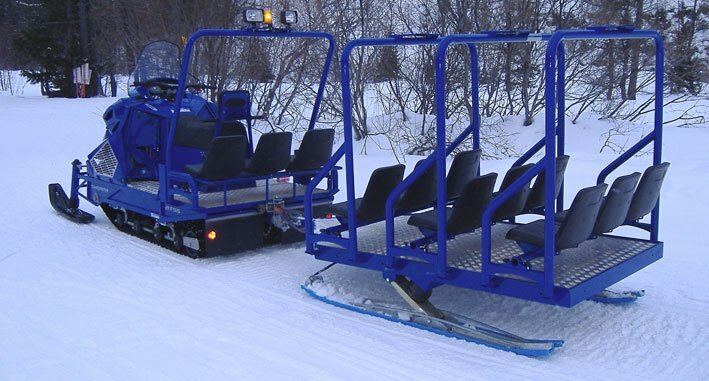 Work-lights, special towing hitches, ROPS guard and extra seats for 3 people, are just a few among many options available. Beside, Alpina offers a complete range of implements dedicated to the Sherpa, like track-makers, trailers for transportation of materials and passengers, rescue-systems for injured skiers, etc.